Previous Green Hedge projects were sold to Anesco. Image: Anesco. Green Hedge, which has developed 200MW of renewables in Britain to date, mainly large-scale solar PV, netted £30 million of funding towards battery storage projects from investor Zouk Capital in July. By that time, through a subsidiary company, Green Hedge Energy 2 Barn Ltd, the company had already in late May applied to South Derbyshire District Council, in the Midlands, for permission to construct the project. According to the planning applications, the project would be a “40MW energy storage scheme (sui generis - ‘standalone’) to provide back up electricity services to the grid for a period of 25 years from the date of commission” of the battery storage project. The planned development is at Breach Farm, in Swadlincote, Derbyshire. The area where the plant is to be built used to be coal-country. Indeed, the council warns that there may be “unrecorded coal mining hazards” in the vicinity of the plant. In contrast, a lack of hazardous waste, effluent or sewage expected from the energy storage facility, including a lack of noise, helped win the application, it seems. The dozens of blueprints and documents sent in to South Derbyshire Council make for interesting reading. When announcing Zouk Capital’s £30 million investment back in July, Green Hedge said the money would be used to fuel expansion of the developer’s pipeline of ‘Energy Barns’, the brand name it has given to its large-scale lithium-ion battery energy storage projects, enclosed in steel-framed barns. At the moment, their chief purpose will be to provide frequency regulation services to UK transmission network operator (TNO) National Grid and bid into the capacity market, the mechanism for ensuring the network remains stable and ‘the lights stay on’ in Britain. 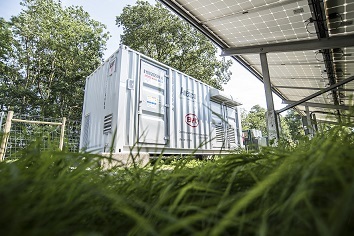 Having sold four 10MW systems to commercial energy solutions provider Anesco following a co-development deal in 2016, each backed with 15-year contracts in National Grid’s capacity market, Green Hedge said that going forward it expects to retain energy storage assets on its balance sheet, rather than sell them on. The company claimed in July to have a 10.5GW pipeline of UK projects, for which it has applied for grid connections.